The instructors from High Country Outfitters generally don’t recommend you dress like you’re going to brunch when you first try stand-up paddleboarding. But the woman’s success told a truth about the sport known as SUP: It doesn’t take serious grace or athleticism to get started. 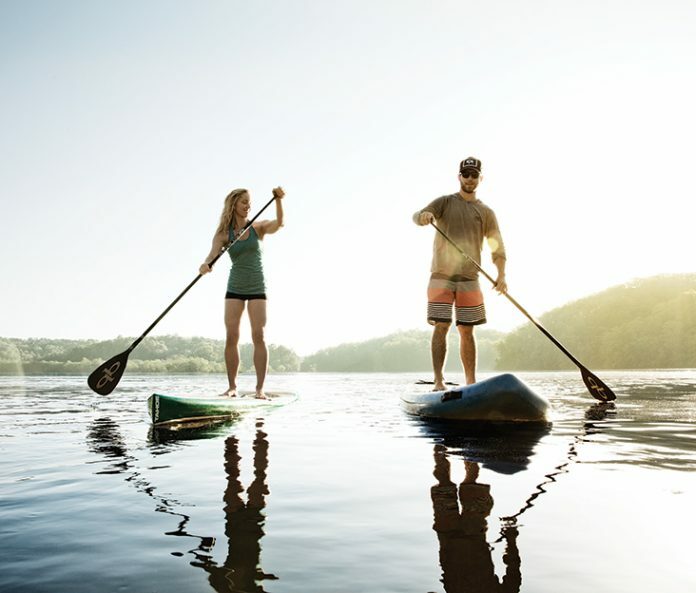 That may be why paddleboarding has become so popular, with a recent study showing that SUP had more new participants in 2012 than any other recreational activity. Or maybe it’s all those photos of a bikini-clad Jennifer Aniston astride a board in a tropical locale, working on her enviable abs. I covet that kind of core, so I signed up for High Country’s weekly demo of boards for purchase. I didn’t try that kind of multitasking in class. Per Peters’s instruction, I positioned the board along the edge of the dock, then slowly knelt on it. And I began to float away. Rentals at Sandy Creek Park and Lake Chapman recreation area in Athens. $15 for one hour. Demos Thursdays at Morgan Falls Overlook Park, plus yoga on Sundays. $25 demo, $50 yoga ($25 if you BYO board). Hourly and full-day rentals; classes include SUP 101, SUP yoga, and Paddle­Fit—a workout on the water. $25 for a one-hour rental, $30 for a class, $60 for a private class. Lessons on Lake Blue Ridge. $90 for a two-hour private lesson, $65 for a two-hour small group lesson. Two-hour introductory class on Saturdays and Sundays for $93.